Colbert Mocks North Korea's "Celebrity Couple Technology"
"The danger here is North Korea has now developed celebrity couple technology and America has always been the undisputed superpower of celebrity couples." 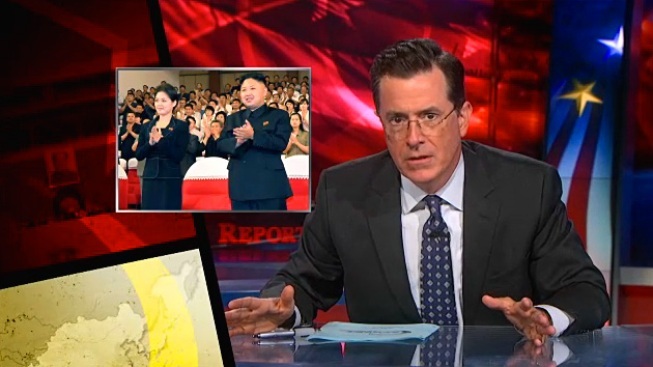 "The Colbert Report" host Stephen Colbert mocked the increased media scrutiny surrounding North Korean leader Kim Jong-un's "mystery woman," and what it could mean to America's superpower status. North Korea's nuclear technology has long been considered a threat to international security, and on Tuesday's episode of "The Colbert Report," host Stephen Colbert looked at how North Korea's recent development of a new technology can potentially threaten America's superpower status. "North Korea is as dangerous as ever. They have a nuclear bomb, and they are this close to inventing food," the late night host quipped. "But now there is another reason to fear our Far East rival." Colbert poked fun at the media scrutiny surrounding Kim Jong-un's "mystery woman," showing a clip of a CNN reporter speculating over the identity of a woman seen accompanying the North Korean leader to several public appearances. Last Sunday Kim was accompanied by the unidentified woman at a ceremony honoring his late grandfather, Kim Il-sung. Before that, she was seen with Kim at a Disney-themed performance. Colbert goes on to speculate that the mystery woman is Hyon Song-wol, the former lead singer of Bochonbo Electronic Music Band. "There's the cute one, the quiet one, the smart one, and the one forced into a relationship with the dictator," Colbert joked. But according to Colbert, the relationship between the North Korean leader and the former singer could be a dangerous one. "The danger here is North Korea has now developed celebrity couple technology, and America has always been the undisputed superpower of celebrity couples," Colbert mocked. Lamenting the recent demise of celebrity power couple TomKat and the need to buffer remaining power couples Brangelina and Filliam H. Muffman, Colbert came up with a solution that would keep threats to America's superpower celebrity couple status at bay. "So I am calling on the newly available Katie Holmes to take one for the team," Colbert proclaimed. "Break those two up and form the power couple KimKat!"